Good for All is Christian poetry that expands upon ideas and concepts frequently found in praise music. 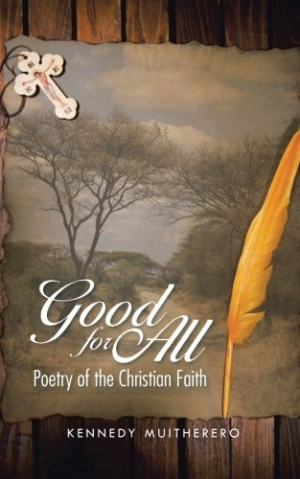 Kennedy Muitherero’s Good for All: Poetry of the Christian Faith offers poems that consider a wide range of Christian ideas. Muitherero tackles common Christian theological themes including truth, God’s work, and Jesus, all from a conservative point of view. Poems also consider experiences of faith, love, and praise from the perspective of an individual believer. The collection includes more than seventy poems, most a page or so long or a few stanzas each. The best of these poems take on difficult topics, such as faith, God’s love, or wisdom, and break them down using easily recognizable language and simple words and phrases. Each poem’s theme is easily recognizable from its title, making the collection easy to navigate. Many of the poems offer approachable perspectives on living a life of faith. Theological words and concepts run throughout and will appeal to those familiar with ideas such as atonement, grace, and the kingdom of God. These themes are at the center of poems, which come to focus less on sensory material as a result. This is poetry interested in describing moments of people’s lives or commenting on how to find truth or God’s love. The end result is a work more akin to the psalms than to modern poets and that could easily be adapted in liturgical settings. Poems make use of end-rhyming schemes. These sometimes feel forced and clunky, however, and often get in the way of other imagery. That said, there are instances of effectively crafted imagery that evoke technological ideas (“codes” and “passwords”), biblical allusions (“rock ground” and “sand floors”), and things like “dead silence” and “a breathing ear.” Such word choices work to highlight life from a Christian perspective. In “Times,” end rhymes hinge on the word “just,” resulting in biblically rich evocations, and placing that justice in “wisdom,” “culture,” and “secrets.” The poem’s willingness to play with the rhyme structure makes it more meaningful because it allows for a broader exploration of topic. Throughout, poems where the end-rhyming structure is less tightly used work best. “Age” begins with the line “Age is a no return journey” before letting the rhyme trickle forward, ending on the idea of grace. The poem’s final line turns it back to God: “As is God’s intention.” “Visitation” begins with “Do not hate,” then speaks of the “nostalgic past” and “the future to cast.” Its shift from the coming of Jesus to Jesus’s meaning is expertly done. The collection offers similar dances of meaning elsewhere: “People” flips from addressing people to addressing God; “Power” flips from addressing power to “vice” dying; “Today” flips from what’s current to “for soon is to be numbered every saint.” These focused transitions represent the work at its most powerful. Muitherero’s Good for All is Christian poetry that expands upon ideas and concepts frequently found in praise music, suiting it to incorporation in churches.